In the city, a bag full of rhubarb is the secret language of people with gardens in their pasts. Our garden gates were a row of peas on one side, rhubarb on the other. I was the pea cheerleader, a watchdog of their progress up my mom’s hand-made trellis, a carefully strung contraption of dowels and kitchen twine. Thanks to my reputation for gauging the peas’ growth by eating them, I was warned away from the rhubarb whose big, billowy leaves I had been told were poisonous. Frankly, I wasn’t much interested in anything that I couldn’t pluck or pull right from the earth and stick directly in my mouth—even carrots, after a quick shake—that having the rhubarb off-limits wasn’t a much of a loss. Now, I treasure it. Even its most skinny spring stalks can survive a day being carted around Brooklyn in this writer’s purse in an attempt to have it all: rhubarb and time with a good friend in one perfect Saturday with imperfect public transit. If you tell someone what to do with rhubarb, they will think that you know something and feel as if you have given them a gift. 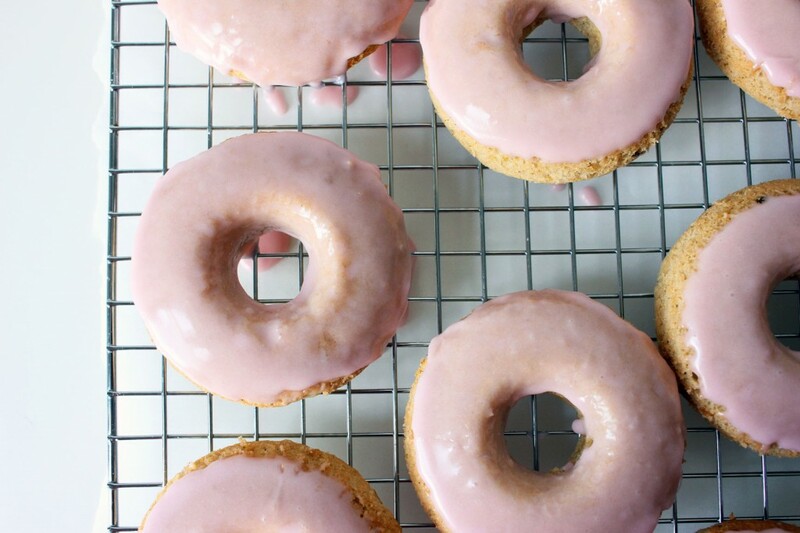 And if, say, you put rhubarb in a donut that’s something to be proud of. Combine the rhubarb and water in a small saucepan over very low heat. Stir frequently, cooking just until the rhubarb is completely broken down. 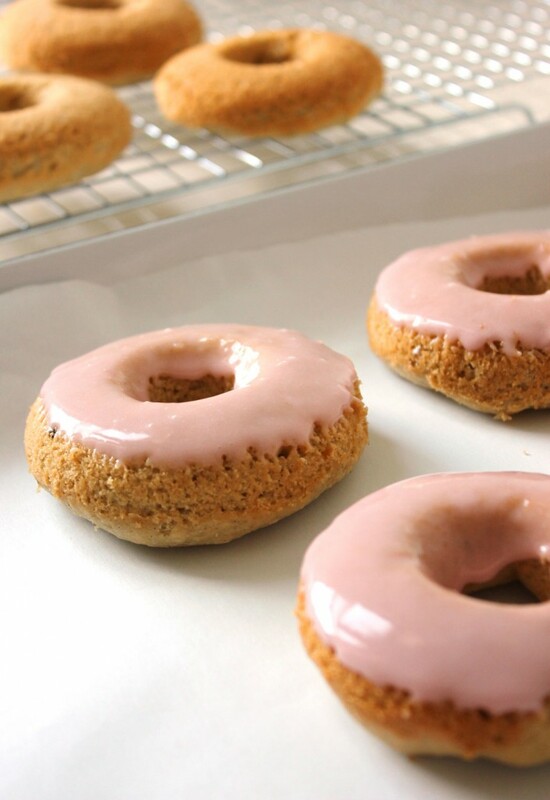 Remove from heat and allow to cool slightly while you assemble the donut ingredients. You’ll use about half of this for the donuts and about half for the glaze. Generously oil two donut pans (6 donuts each) with coconut oil and set aside. Preheat the oven to 325. Combine the sugar, brown rice flour, garbanzo and fava bean flour, potato starch, arrowroot, baking powder, xanthan gum, salt, and baking soda in a large bowl. Whisk until fully incorporated. Make a well in the center and add the cooked rhubarb, vanilla extract, vanilla bean seeds, coconut oil, and hot tap water. Stir until fully combined. Using a melon baller or a tablespoon, put 3-4 tablespoons of batter in each donut mold and use a toothpick to spread it evenly. Bake for 16 minutes, rotating once after 8 minutes. 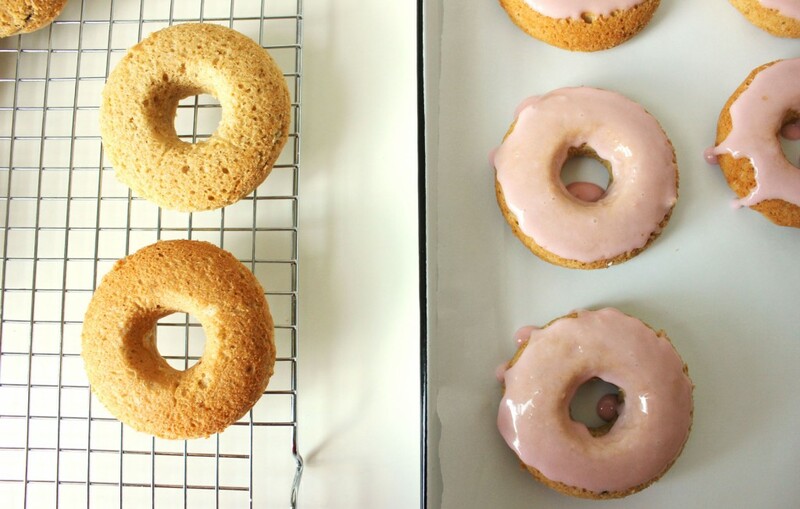 Allow donuts to cool in the pan for 5 minutes, then remove them to a wire rack to cool completely. Put the remaining cooked rhubarb into a fine mesh strainer positioned over a small bowl. Stir the cooked rhubarb to help separate the pulp and strain the juice. Reserve the pulp for another use or discard. Measure 1/8 cup of the strained juice (You should have a bit more than that. If you’re shy, you can sneak in a little water to make up the difference.) and combine it in a small bowl with 1 1/3 cup confectioner’s sugar. Stir until smooth. Disclosure: There’s an Amazon.com affiliate link up there, which means I will receive an itty bitty commission on all purchases made through Amazon links in this post. I absolutely love the sound of these! Yum! 1. I’m so glad your rhubarb survived, especially considering how wee the little stalks were! Thank you for risking your rhubarb to come hang with me in Brooklyn, even if it meant no Smorgasbord! 2. Donuts are one of the few foods that allude me, humble me and yet somehow compel me to bike halfway across my city at 6am. The fact that you’ve made them look this gorgeous is remarkable and worthy of my highest praise. 3. As you know from my “When in Rome” Ireland-rhubarb yogurt story, I have a thing for rhubarb in unusual places. Why we don’t adapt it as a year-round flavor, I’ll never know! I’m definitely going to hoard some more rhubarb in the freezer this year Kelly! Rhubarb in December for sure. oh AND THIS GIF. it’s just tops! I could dive right into that bowl of icing, yes please! These look absolutely gorgeous! 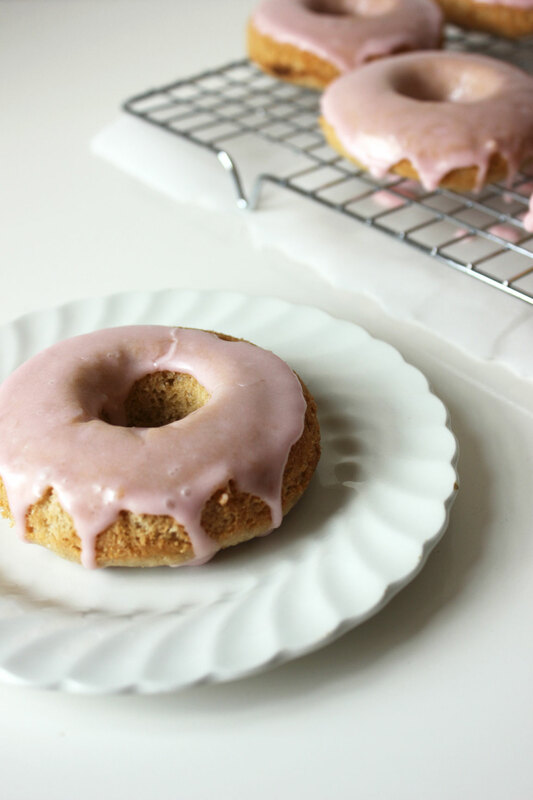 I love the sound of rhubarb and vanilla donuts and I really love your pink rhubarb frosting! Thanks, Rosie! I was so happy to get that color naturally from just the rhubarb juice. Damn you and your rhubarb! I still haven’t cooked with a single stalk yet this season, and it’s making me sad. Come to NJ and rescue me from my rhubarb-deprived existence! Haha! How did you know that I make rhubarb deliveries? It’s still early though. This is the first week it has been at markets around here, Casey. girl you made donuts! pink rhubarb donuts! wow! Do you have a suggestion of how to substitute with GF baking mix? I don’t bake enough to make buying several kinds of flour economical, but these look delicious!! Thanks! Lovely post! I got a stalk of rhubarb, was looking for something to make, and came across your recipe. Happy to have stumbled onto your blog – it’s beautiful. Thanks, Tina. That’s part of why I like this recipe is it doesn’t require a huge quantity of rhubarb. Basically, I’m still obsessed with these a year later. Basically. Just wondering if the icing is flavoured as rhubarb or if the rhubarb is just used for colour. Thanks in advance! it adds a slight tartness for sure, but it’s mostly for color. Thank you! 50 Pastel Desserts for Spring - Chocolate Chocolate and More!